Lance Lysowski of the Buffalo News: (mailbag) The Buffalo Sabres could use some more size and physical presence on their roster for next season. Jeff Skinner won’t be going anywhere, as the sides will get the deal done. Both Carter Hutton and Linus Ullmark will back next season. Forward Jason Pominville would love to return to the Sabres next season but doesn’t see it happening. 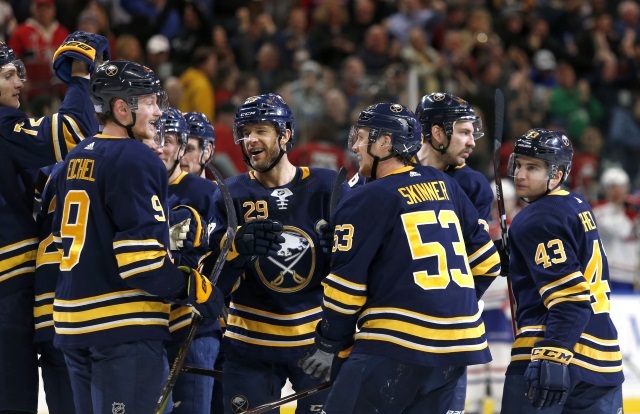 The Sabres need to address their lack of depth and grit up front this offseason. General manager Jason Botterill will have some decisions to make regarding their bottom-six. Pending RFAs Johan Larsson and/or Zemgus Girgensons may not be back. Vladimir Sobotka has a year left on his contract and likely won’t get much interest on the trade market. Defensemen Marco Scandella, Rasmus Ristolainen and Matt Hunwick all have a year left on their contract but could be shopped this offseason. isn’t convinced they’d trade Ristolainen though. Ryan Stimson of The Athletic: The Buffalo Sabres need to add depth up front and maybe to their blueline as well. The Sabres will likely qualify RFA defenseman Jake McCabe at $1.775 million. They could look at keeping one of Johan Larsson or Zemgus Girgensons. With the Sabres needing to give out new contracts to Jeff Skinner, Sam Reinhart, Rasmus Dahlin and Brandon Montour between now and the end of next year, they may not be looking to throw a lot of money around to free agents this offseason. They could still look to sign one bigger named free agent though, maybe a Matt Duchene or Jordan Eberle. Joonas Donskoi could be one value signing they’d look at – maybe a three- or four-year deal in the $3 to $4 million range. Other options could be Jordan Weal or Michael Raffl.